Behind the successful conversion of biomass to a better biofuel or a new green chemical, there is a carefully chosen solvent. The right solvent not only dissolves biomass but also drives the efficiency of the entire conversion process, resulting in higher yields and a lower bottom line. 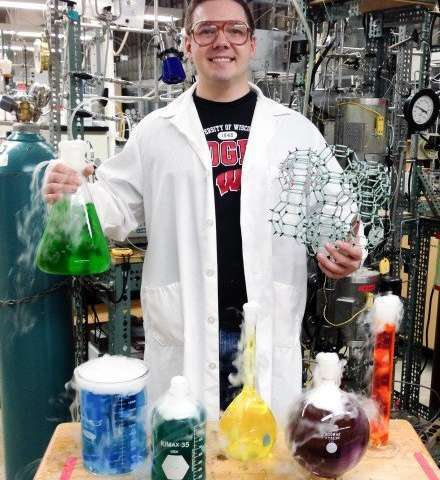 For researchers at the Great Lakes Bioenergy Research Center (GLBRC), the central role of solvents in converting non-food biomass to biofuels and bioproducts means they're ripe for optimization. Better use of solvents could improve the economics of biorefineries, push a range of new and more sustainable biofuels and bioproducts to market, and provide new sources of revenue for farmers. But the organic solvents used in biomass conversion are both critical to the process and a little mysterious. That is, scientists do not fundamentally understand "solvent effects—or the role that solvents can play in changing reaction rates, reaction pathways, product distributions, or yields. "We've seen solvent effects in reactions for many years," says Max Mellmer, a research investigator at Bristol-Myers Squibb and a former University of Wisconsin–Madison graduate student in the of lab of chemical and biological engineering professor James Dumesic. "But we don't understand, catalytically, how they work." 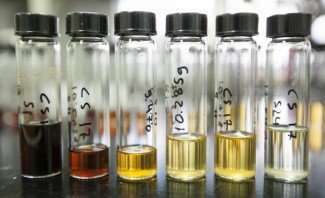 While researchers of all stripes have traditionally chosen different solvents based on their known properties, Mellmer and collaborators are pushing for a broader understanding, one that would allow researchers to not only better understand solvent effects but also use that knowledge to optimize biomass conversion reactions. "We wanted to design a system where we could study and predict solvent effects at a fundamental level and try to understand their role in catalytic processes," says Mellmer. "We're trying to move toward more rational solvent selection for reactions." In a paper recently published in Nature Catalysis, first author Mellmer and GLBRC colleagues break down solvent effects, finding a new way to measure and analyze how a solvent alters the stability of two different points of a chemical reaction, the initial state and the transition state. The method, which relies on experimentation and computation, is the first to provide a window into the fundamental properties of solvent effects. The team's system for predicting solvent effects has immediate practical applications. The researchers used their understanding of solvent effects to achieve high yields of hydroxymethylfurfural (HMF), a platform chemical that can be used to make transportation fuels and bio-based plastics, while limiting HMF's subsequent conversion to other chemicals. This "selective production" of a platform chemical is important, as HMF and a number of other chemicals are of high interest to the chemicals industry. Lowering the production cost of these chemicals from biomass could mean the chance to replace petroleum-derived chemicals and products with more sustainable, biomass-derived equivalents. In fact, a recent study out of the Dumesic's lab describes using HMF as an intermediary to furandicarboxylic acid (FDCA), a bio-based plastic precursor with the potential to dramatically improve the economics of making plastic from biomass. "These findings are fundamental to achieving economically competitive biofuels and bioproducts," says Dumesic. "If we're going to realize a future in which our fuels and products are bio-based, we have to optimize every step of our conversion processes and develop new and inexpensive ways of making high-value products from biomass."